"Mary II" redirects here. For other uses, see Mary II (disambiguation). 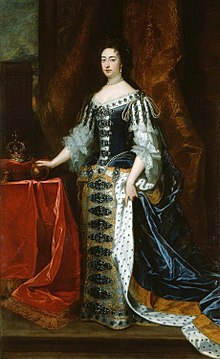 Mary, born at St James's Palace in London on 30 April 1662, was the eldest daughter of the Duke of York (the future King James II & VII), and his first wife, Anne Hyde. Mary's uncle was King Charles II, who ruled the three kingdoms of England, Scotland and Ireland; her maternal grandfather, Edward Hyde, 1st Earl of Clarendon, served for a lengthy period as Charles's chief advisor. She was baptised into the Anglican faith in the Chapel Royal at St James's, and was named after her ancestor, Mary, Queen of Scots. Her godparents included her father's cousin, Prince Rupert of the Rhine. Although her mother bore eight children, all except Mary and her younger sister Anne died very young, and King Charles II had no legitimate children. Consequently, for most of her childhood, Mary was second in line to the throne after her father. The Duke of York converted to Roman Catholicism in 1668 or 1669 and the Duchess about eight years earlier, but Mary and Anne were brought up as Anglicans, pursuant to the command of Charles II. They were moved to their own establishment at Richmond Palace, where they were raised by their governess Lady Frances Villiers, with only occasional visits to see their parents at St James's or their grandfather Lord Clarendon at Twickenham. Mary's education, from private tutors, was largely restricted to music, dance, drawing, French, and religious instruction. Her mother died in 1671, and her father remarried in 1673, taking as his second wife Mary of Modena, a Catholic who was only four years older than Mary. From about the age of nine until her marriage, Mary wrote passionate letters to an older girl, Frances Apsley, the daughter of courtier Sir Allen Apsley. Mary signed herself 'Mary Clorine'; Apsley was 'Aurelia'. In time, Frances became uncomfortable with the correspondence, and replied more formally. At the age of fifteen, Mary became betrothed to her cousin, the Protestant Stadtholder of Holland, William III of Orange. William was the son of the King's late sister, Mary, Princess Royal, and thus fourth in the line of succession after James, Mary, and Anne. At first, Charles II opposed the alliance with the Dutch ruler—he preferred that Mary wed the heir to the French throne, the Dauphin Louis, thus allying his realms with Catholic France and strengthening the odds of an eventual Catholic successor in Britain; but later, under pressure from Parliament and with a coalition with the Catholic French no longer politically favourable, he approved the proposed union. The Duke of York agreed to the marriage, after pressure from chief minister Lord Danby and the King, who incorrectly assumed that it would improve James's popularity among Protestants. When James told Mary that she was to marry her cousin, "she wept all that afternoon and all the following day". William and a tearful Mary were married in St James's Palace by Bishop Henry Compton on 4 November 1677. Mary accompanied her husband on a rough sea crossing back to the Netherlands later that month, after a delay of two weeks caused by bad weather. Rotterdam was inaccessible because of ice, and they were forced to land at the small village of Ter Heijde, and walk through the frosty countryside until met by coaches to take them to Huis Honselaarsdijk. On 14 December, they made a formal entry to The Hague in a grand procession. 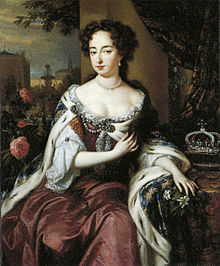 Mary's animated and personable nature made her popular with the Dutch people, and her marriage to a Protestant prince was popular in Britain. She was devoted to her husband, but he was often away on campaigns, which led to Mary's family supposing him to be cold and neglectful. Within months of the marriage Mary was pregnant; however, on a visit to her husband at the fortified city of Breda, she suffered a miscarriage, which may have permanently impaired her ability to have children. She suffered further bouts of illness that may have been miscarriages in mid-1678, early 1679, and early 1680. Her childlessness would be the greatest source of unhappiness in her life. From May 1684, King Charles's illegitimate son, James Scott, Duke of Monmouth, lived in the Netherlands, where he was fêted by William and Mary. Monmouth was viewed as a rival to the Duke of York, and as a potential Protestant heir who could supplant the Duke in the line of succession. William, however, did not consider him a viable alternative and correctly assumed that Monmouth had insufficient support. Upon the death of Charles II without legitimate issue in February 1685, the Duke of York became king as James II in England and Ireland and James VII in Scotland. Mary was playing cards when her husband informed her of her father's accession, and that she was heir presumptive. When Charles's illegitimate son the Duke of Monmouth assembled an invasion force at Amsterdam, and sailed for Britain, William informed James of the Duke's departure, and ordered English regiments in the Low Countries to return to Britain. To William's relief, Monmouth was defeated, captured and executed, but both he and Mary were dismayed by James's subsequent actions. James had a controversial religious policy; his attempt to grant freedom of religion to non-Anglicans by suspending acts of Parliament by royal decree was not well received. Mary considered such action illegal, and her chaplain expressed this view in a letter to the Archbishop of Canterbury, William Sancroft, on her behalf. She was further dismayed when James refused to help when the Catholic King of France, Louis XIV, invaded Orange and persecuted Huguenot refugees there. In an attempt to damage William, James encouraged his daughter's staff to inform her that William was having an affair with Elizabeth Villiers, the daughter of her childhood governess Frances Villiers. Acting on the information, Mary waited outside Villiers's room and caught her husband leaving it late at night. William denied adultery, and Mary apparently believed and forgave him. Possibly, Villiers and William were not meeting as lovers but to exchange diplomatic intelligence. Mary's staff was dismissed and sent back to Britain. Disgruntled Protestant politicians and noblemen were in contact with Mary's husband as early as 1686. After James took the step of forcing Anglican clergymen to read the Declaration of Indulgence—the proclamation granting religious liberty to Catholics and dissenters—from their churches in May 1688, his popularity plunged further. Alarm amongst Protestants increased when his wife, Mary of Modena, gave birth to a son—James Francis Edward—in June 1688, for the son would, unlike Mary and Anne, be raised a Roman Catholic. Some charged that the boy was "supposititious", having been secretly smuggled into the Queen's room in a bed-warming pan as a substitute for her stillborn baby. Seeking information, Mary sent a pointed list of questions to her sister, Anne, regarding the circumstances of the birth. Anne's reply, and continued gossip, seemed to confirm Mary's suspicions that the child was not her natural brother, and that her father was conspiring to secure a Catholic succession. On 30 June, the "Immortal Seven" secretly requested William—then in the Dutch Republic with Mary—to come to England with an army to depose James. William had made known earlier that a military intervention, for which he had been assembling forces, would be conditional on such an invitation. At first, William was still reluctant; possibly he was jealous of his wife's position as the heiress to the English Crown and feared she would become more powerful than he was. According to Gilbert Burnet, however, Mary convinced her husband that she did not care for political power, and told him "she would be no more but his wife, and that she would do all that lay in her power to make him King for life". She would, she assured him, always obey her husband as she had promised to do in her marriage vows. William agreed to invade and issued a declaration which referred to James's newborn son as the "pretended Prince of Wales". He also gave a list of grievances of the English people and stated that his proposed expedition was for the sole purpose of having "a free and lawful Parliament assembled". William and the Dutch army, without Mary who stayed behind in the Netherlands, finally landed on 5 November 1688, having been turned back by storms in October. The disaffected English Army and Navy went over to William, and on 11 December the defeated King James attempted to flee, but was intercepted. A second attempt at flight, on 23 December, was successful; William deliberately allowed James to escape to France, where he lived in exile until his death. Mary was upset by the circumstances surrounding the deposition of her father, and was torn between concern for him and duty to her husband, but was convinced that her husband's actions, however unpleasant, were necessary to "save the Church and State". When Mary travelled to England after the New Year, she wrote of her "secret joy" at returning to her homeland, "but that was soon checked with the consideration of my father's misfortunes". William ordered her to appear cheerful on their triumphant arrival in London. As a result, she was criticised by Sarah Churchill among others, for appearing cold to her father's plight. James, too, wrote a diatribe against her criticising her disloyalty, an action which deeply affected the pious Mary. In January 1689, a Convention Parliament summoned by the Prince of Orange assembled, and much discussion relating to the appropriate course of action ensued. A party led by Lord Danby held that Mary should be sole monarch, as the rightful hereditary heir, while William and his supporters were adamant that a husband could not be subject to his wife. William wished to reign as a king, rather than function as a mere consort of a queen. For her part, Mary did not wish to be queen regnant, believing that women should defer to their husbands, and "knowing my heart is not made for a kingdom and my inclination leads me to a retired quiet life". On 13 February 1689, Parliament passed the Declaration of Right, in which it deemed that James, by attempting to flee on 11 December 1688, had abdicated the government of the realm, and that the Throne had thereby become vacant. Parliament offered the Crown not to James's eldest son, James Francis Edward (who would have been the heir apparent under normal circumstances), but to William and Mary as joint sovereigns. The only precedent for a joint monarchy dated from the sixteenth century: when Queen Mary I married Philip of Spain, it was agreed that the latter would take the title of king, but only during his wife's lifetime, and restrictions were placed on his power. 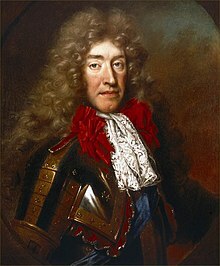 William, however, would be king even after his wife's death, and "the sole and full exercise of the regal power [would be] executed by the said Prince of Orange in the names of the said Prince and Princess during their joint lives." The declaration was later extended to exclude not only James and his heirs (other than Anne) from the throne, but all Catholics, since "it hath been found by experience that it is inconsistent with the safety and welfare of this Protestant kingdom to be governed by a papist prince". The Bishop of London, Henry Compton (one of the "Immortal Seven"), crowned William and Mary together at Westminster Abbey on 11 April 1689. Normally, the Archbishop of Canterbury performs coronations, but the incumbent Archbishop, William Sancroft, although an Anglican, refused to recognise the validity of James II's removal. Neither William nor Mary enjoyed the ceremony; she thought it "all vanity" and William called it "Popish". On the same day, the Convention of the Estates of Scotland—which was much more divided than the English Parliament—finally declared that James was no longer King of Scotland, that "no Papist can be King or Queen of this Realm", that William and Mary would be joint sovereigns, and that William would exercise sole and full power. The following day, they were proclaimed king and queen in Edinburgh. They took the Scottish coronation oath in London on 11 May. Even after the declaration, there was still substantial support for James in Scotland. Viscount Dundee raised an army in the Scottish Highlands and won a convincing victory at Killiecrankie on 27 July. The huge losses suffered by Dundee's troops, however, coupled with his fatal wounding at the start of the battle, served to remove the only effective resistance to William and the uprising was quickly crushed, suffering a resounding defeat the next month at the Battle of Dunkeld. In December 1689, Parliament passed one of the most important constitutional documents in English history, the Bill of Rights. This measure—which restated and confirmed many provisions of the earlier Declaration of Right—established restrictions on the royal prerogative; it declared, among other things, that the Sovereign could not suspend laws passed by Parliament, levy taxes without parliamentary consent, infringe the right to petition, raise a standing army during peacetime without parliamentary consent, deny the right to bear arms to Protestant subjects, unduly interfere with parliamentary elections, punish members of either House of Parliament for anything said during debates, require excessive bail, or inflict cruel or unusual punishments. The Bill of Rights also confirmed the succession to the throne. Following the death of either William III or Mary II, the other was to continue to reign. Next in the line of succession would be any children of the couple, to be followed by Mary's sister Anne and her children. Last in the line of succession stood any children William III might have had from any subsequent marriage. From 1690 onwards, William was often absent from England on campaign, each year generally from the spring until the autumn. In 1690, he fought Jacobites (who supported James) in Ireland. William had crushed the Irish Jacobites by 1692, but he continued with campaigns abroad to wage war against France in the Netherlands. Whilst her husband was away, Mary administered the government of the realm with the advice of a nine-member Cabinet Council. She was not keen to assume power and felt "deprived of all that was dear to me in the person of my husband, left among those that were perfect strangers to me: my sister of a humour so reserved that I could have little comfort from her." Anne had quarrelled with William and Mary over money, and the relationship between the two sisters had soured. When her husband was away, Mary acted on her own if his advice was not available; whilst he was in England, Mary completely refrained from interfering in political matters, as had been agreed in the Declaration and Bill of Rights, and as she preferred. However, she proved a firm ruler, ordering the arrest of her own uncle, Henry Hyde, 2nd Earl of Clarendon, for plotting to restore James II to the throne. In January 1692, the influential John Churchill, 1st Earl of Marlborough, was dismissed on similar charges; the dismissal somewhat diminished her popularity and further harmed her relationship with her sister Anne (who was strongly influenced by Churchill's wife, Sarah). Anne appeared at court with Sarah, obviously supporting the disgraced Churchill, which led to Mary angrily demanding that Anne dismiss Sarah and vacate her lodgings. Mary fell ill with a fever in April 1692, and missed Sunday church service for the first time in 12 years. She also failed to visit Anne, who was suffering a difficult labour. After Mary's recovery and the death of Anne's baby soon after it was born, Mary did visit her sister, but chose the opportunity to berate Anne for her friendship with Sarah. The sisters never saw each other again. Marlborough was arrested and imprisoned, but then released after his accuser was revealed to be an impostor. Mary recorded in her journal that the breach between the sisters was a punishment from God for the "irregularity" of the Revolution. She was extremely devout, and attended prayers at least twice a day. Many of Mary's proclamations focus on combating licentiousness, insobriety and vice. She often participated in the affairs of the Church—all matters of ecclesiastical patronage passed through her hands. On the death of Archbishop of Canterbury John Tillotson in December 1694, Mary was keen to appoint Bishop of Worcester Edward Stillingfleet to the vacancy, but William over-ruled her and the post went to Bishop of Lincoln Thomas Tenison. Mary was tall (5 foot 11 inches; 180 cm) and apparently fit; she would regularly walk between her palaces at Whitehall and Kensington. In late 1694, however, she contracted smallpox. She sent away anyone who had not previously had the disease, to prevent the spread of infection. Anne, who was once again pregnant, sent Mary a letter saying she would run any risk to see her sister again, but the offer was declined by Mary's groom of the stole, the Countess of Derby. Mary died at Kensington Palace shortly after midnight on the morning of 28 December, at the young age of 32. William, who had grown increasingly to rely on Mary, was devastated by her death, and told Burnet that "from being the happiest" he was "now going to be the miserablest creature on earth". While the Jacobites considered her death divine retribution for breaking the fifth commandment ("honour thy father"), she was widely mourned in Britain. During a cold winter, in which the Thames froze, her embalmed body lay in state in Banqueting House, Whitehall. On 5 March, she was buried at Westminster Abbey. Her funeral service was the first of any royal attended by all the members of both Houses of Parliament. For the ceremony, composer Henry Purcell wrote Music for the Funeral of Queen Mary. Mary endowed the College of William and Mary (in the present day Williamsburg, Virginia) in 1693, supported Thomas Bray, who founded the Society for Promoting Christian Knowledge, and was instrumental in the foundation of the Royal Hospital for Seamen, Greenwich, after the Anglo-Dutch victory at the Battle of La Hogue. She is credited with influencing garden design at Het Loo and Hampton Court Palaces, and with popularising blue and white porcelain and the keeping of goldfish as pets. Mary was depicted by Jacobites as an unfaithful daughter who destroyed her father for her own and her husband's gain. In the early years of their reign, she was often seen as completely under the spell of her husband, but after she had temporarily governed alone during his absences abroad, she was portrayed as capable and confident. Nahum Tate's A Present for the Ladies (1692) compared her to Queen Elizabeth I. Her modesty and diffidence were praised in works such as A Dialogue Concerning Women (1691) by William Walsh, which compared her to Cincinnatus, the Roman general who took on a great task when called to do so, but then willingly abandoned power. A week before her death, Mary went through her papers, weeding out some which were burnt, but her journal survives, as do her letters to William and to Frances Apsley. The Jacobites lambasted her, but the assessment of her character that came down to posterity was largely the vision of Mary as a dutiful, submissive wife, who assumed power reluctantly, exercised it with considerable ability when necessary, and willingly deferred it to her husband. The joint style of William III and Mary II was "William and Mary, by the Grace of God, King and Queen of England, France and Ireland, Defenders of the Faith, etc." when they ascended the English throne. From 11 April 1689—when the Estates of Scotland recognised them as sovereigns—the royal couple used the style "William and Mary, by the Grace of God, King and Queen of England, Scotland, France and Ireland, Defenders of the Faith, etc.". The coat of arms used by the King and Queen were: Quarterly, I and IV Grandquarterly, Azure three fleurs-de-lis Or (for France) and Gules three lions passant guardant in pale Or (for England); II Or a lion rampant within a double tressure flory-counter-flory Gules (for Scotland); III Azure a harp Or stringed Argent (for Ireland); overall an escutcheon Azure billetty a lion rampant Or (for the House of Orange-Nassau). ^ Mary II was declared Queen by the Parliament of England on 13 February 1689 and by the Parliament of Scotland on 11 April 1689. ^ John Pollock. The Policy of Charles II and James II. (1667–87.). ^ a b "Mary II". Encyclopædia Britannica. XVII (11th ed.). New York: Encyclopædia Britannica, Inc. 1911. p. 816. ^ "The House of Stuart: William III and Mary II". English Monarchs. 2004. Retrieved 18 September 2006. ^ a b c d e "King James' Parliament: The succession of William and Mary". The History and Proceedings of the House of Commons: volume 2. British History Online. 1742. pp. 255–77. Retrieved 19 September 2006. ^ a b "William III and Mary II". The Royal Household. Retrieved 18 September 2006. ^ "William Sancroft". Encyclopædia Britannica. Encyclopædia Britannica Online. 2006. Retrieved 21 September 2006. ^ "John Graham of Claverhouse, 1st viscount of Dundee". Encyclopædia Britannica. Encyclopædia Britannica Online. 2006. Retrieved 21 September 2006. ^ "The Contemplator's Short History of "Bonnie Dundee" John Graham, Earl of Claverhouse, Viscount of Dundee". Retrieved 20 September 2006. ^ a b "Bill of Rights". 1689. Retrieved 19 September 2006. ^ See also the Absence of King William Act 1689. ^ "Music for Queen Mary". The Public Library of Cincinnati and Hamilton County. Retrieved 18 September 2006. ^ "No. 1249". The London Gazette. 5 November 1677. p. 1. ^ Brewer, E. Cobham (1898). Dictionary of Phrase and Fable. Philadelphia: Henry Altemus Company. p. 891. ^ a b Louda, Jiří; Maclagan, Michael (1999) . Lines of Succession: Heraldry of the Royal Families of Europe (2nd ed.). London: Little, Brown. p. 27. ISBN 978-0-316-84820-6. ^ a b Louda & Maclagan, p. 50. ^ a b c d Louda & Maclagan, p. 140. Wikimedia Commons has media related to Mary II of England. "Mary II." . New International Encyclopedia. 1905.